Hello! I have three simple tips for you today for supporting Outstanding International Books (OIBs) in your school. As I was thinking about how to get momentum for supporting OIBs, it occurred to me that a randomized survey to the teachers and administrators in your school—“What piece of household furniture do you feel most like?”—would overwhelmingly return the response, “I feel like the coffee table: overutilized, and underappreciated.” We are overloaded! There is a very real chance that putting OIBs into the limelight will kick out other important priorities your school has chosen. IBBY Italia invited us, along with other IBBY units, to nominate up to three recent titles for Silent Books: Destination Lampedusa. This juried international project collects the best wordless picture books from around the world for inclusion in a traveling exhibit, a library for refugee children on the island of Lambedusa, and a published compilation of winning titles. The USBBY Board decided to seek suggestions from the membership. We were pleased with the variety and number received. In the end, two titles were suggested most and the Board decided to submit both: Imagine by Raúl Colón and Wolf in the Snow by Matthew Cordell. Thank you for your participation in this unique project! USBBY is thrilled to showcase its new web site. This has been in the works for several years, and thanks to the work of Marion Rocco, Katlyn Raby, Susan Polos, and Tucker Stone, we are successfully launching it this week. The easy to navigate webpage will have fresh, up to date information about USBBY, IBBY and the international world of children’s books. One of the new features is the replacing of the Bridges newsletter with a blog. Please watch for more information about this! From the opening invoking Homer and traditional music to the inspiring keynotes by literacy leaders from around the world, the Megaron Athens Conference Center hosted the 36th International IBBY Congress from October 30 to September 1, 2018. This modernist conference center in the midst of the classical world offered a platform for exploring the refugee crisis through the experiences of the youngest migrants and the literature encapsulating their challenges. Many thanks to all the authors and publishers who helped make so many wonderful book signings happen at the USBBY booth during the ILA 2018 Conference. Check out some of the photos on our Facebook page! Thanks also to every one who attended the Bites of OIB session. USBBY members shared their favorite OIB books along with ideas for using those books in the classroom. Next up for USBBY: we'll be hosting a co-sponsored session at the NCTE conference in Houston this November. Stay tuned for more information! An international comic/graphic novel creator, Liniers (who now lives in Vermont) was among the winners of the Will Eisner Comic Industry Awards, presented at the San Diego Comic-Con in July. His Good Night, Planet published by TOON received the "Best Publication for Early Readers (up to age 8)." Of special importance, our very own USBBY Board member Tucker Stone is sharing the "Best Comics-Related Periodical/Journalism" award along with co-editors Dan Nadel and Timothy Hodler, for The Comics Journal. Huzzah, Tucker! 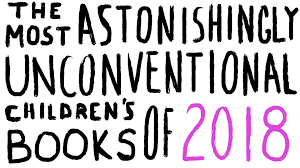 International children's books lauded by T. Jonker as "Unconventional"
In his SLJ "100 Scope Notes" blog on July 17, 2018, Travis Jonker named his picks for "The Most Astonishingly Unconventional Children's Books of 2018." Most astonishlngly--but not really--a majority of the titles were created by authors or illustrators in countries other than the U.S., originally published outside the U.S., or are translated. Some are still in press, so get the list (and a sneak peek) here. Read more about the winner and see all the nominated projects here.